1905 photograph of Reginald Fessenden. The next two years he worked as the principal, and sole instructor, at the Whitney Institute in Bermuda. While there, he became engaged to Helen Trott — they married in September, 1890, and later had a son, Reginald Kennelly Fessenden. Fessenden's classical education had provided him with only a limited amount of scientific and technical training. Interested in increasing his skills in the electrical field, he moved to New York City in 1886, with hopes of gaining employment with the famous inventor, Thomas Edison. His initial attempts were rebuffed — in his first application, Fessenden wrote "Do not know anything about electricity, but can learn pretty quick", to which Edison replied "Have enough men now who do not know about electricity". However, Fessenden persevered, and before the end of the year was hired for a semi-skilled position as an assistant tester for the Edison Machine Works, which was laying underground electrical mains in New York City. He quickly proved his worth, and received a series of promotions, with increasing responsibility for the project. In late 1886, Fessenden began working directly for Edison at the inventor's new Laboratory at in West Orange, New Jersey. A broad range of projects included work in solving problems in chemistry, metallurgy, and electricity. However, in 1890, facing financial problems, Edison was forced to lay off most of the Laboratory employees, including Fessenden. Taking advantage of his recent practical experience, Fessenden was able to find positions with a series of manufacturing companies. Next, in 1892, he received an appointment as professor for the newly formed Electrical Engineering department at Purdue University in West Lafayette, Indiana — while there he helped the Westinghouse Corporation install the lighting for the 1893 World Columbian Exposition in Chicago. Shortly thereafter, George Westinghouse personally recruited Fessenden for the newly created position of chair of the Electrical Engineering department at the Western University of Pennsylvania, the modern-day University of Pittsburgh. In the late 1890s, reports began to appear about the success Guglielmo Marconi was having in developing a practical radio transmitting and receiving system. 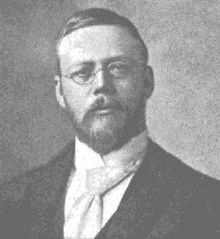 Fessenden began limited radio experimentation, and soon came to the conclusion that he could develop a far more efficient system than the spark-gap transmitter and coherer-receiver combination which had been employed by Oliver Lodge and Marconi. In 1900 Fessenden left the University of Pittsburgh to work for the United States Weather Bureau, with the objective of proving the practicality of using a network of coastal radio stations to transmit weather information, thus avoiding the need to use the existing telegraph lines. The contract gave the Weather Bureau access to any devices Fessenden invented, but he would retain ownership of his inventions. Fessenden quickly made major advances, especially in receiver design, as he worked to develop audio reception of signals. His initial success came from a barretter detector, which was followed by the electrolytic detector that consisted of a fine wire dipped in nitric acid, and for the next few years this latter device would set the standard for sensitivity in radio reception. As his work progressed, Fessenden also evolved the heterodyne principle, which combined the effect of two received signals to produce an audible tone. However, heterodyne reception was not fully practical for a decade after it was invented, since it required a means for producing a stable local signal, which awaited the development of the oscillating vacuum-tube. The initial work took place at Cobb Island, Maryland, located on the Potomac River about 80 kilometers (50 miles) downstream from Washington, DC. While there, Fessenden, experimenting with a high-frequency spark transmitter, successfully transmitted speech on December 23, 1900 over a distance of about 1.6 kilometers (one mile), which appears to have been the first audio radio transmission. At this time the sound quality was too distorted to be commercially practical, but as a test this did show that with further technical refinements it would become possible to transmit audio using radio signals. At this point, two wealthy Pittsburgh, Pennsylvania businessmen, Hay Walker, Jr., and Thomas H. Given, financed the formation of the National Electric Signaling Company (NESCO), to carry on Fessenden's research, including the development of both a high-power rotary-spark transmitter for long-distance radiotelegraph service, and a lower-powered continuous-wave alternator-transmitter, which could be used for both telegraphic and audio transmissions. Brant Rock, at Marshfield, Massachusetts, became the center of operations for the new company. It was decided to try to establish a transatlantic radiotelegraph service, and, in January, 1906, employing his rotary-spark transmitters, Fessenden made the first successful two-way transatlantic transmission, exchanging Morse code messages between a station constructed at Brant Rock and an identical one built at Machrihanish in Scotland. (Marconi had only achieved one-way transmissions at this time.) However, the transmitters could not bridge this distance during daylight hours or in the summer, so work was suspended until later in the year. Then, on December 6, 1906, "owing to the carelessness of one of the contractors employed in shifting some of the supporting cables", the Machrihanish radio tower collapsed, abruptly ending the transatlantic work before it could ever go into commercial service. 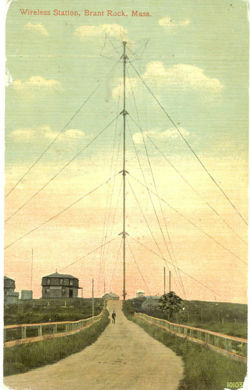 Postcard image, from around 1910, of the 128 meter (420 foot) tall Brant Rock radio tower. The development of a rotary-spark transmitter was something of a stop-gap measure, to be used until a superior approach could be perfected. Fessenden felt that, ultimately, a continuous-wave transmitter — one that produced a pure sine-wave signal on a single frequency — would be far more efficient, particularly because it could be used for quality audio transmissions. His design idea was to take a basic electrical alternator, which normally produced alternating current of at most a few hundred cycles-per-second, and greatly speed it up, in order to create electrical currents of tens-of-thousands of cycles-per-second. Thus, the high-speed alternator would produce a steady radio signal when connected to an aerial. Then, by placing a carbon microphone in the transmission line, the strength of the signal could be varied in order to add sounds to the transmission — in other words, amplitude modulation would be used to add audio information to the radio signal. However, it would take many years of expensive development before even a prototype alternator-transmitter would be ready, and a few more years beyond that for high-power versions to become available. Fessenden contracted with General Electric to help design and produce a series of high-frequency alternator-transmitters. In 1903, Charles Proteus Steinmetz of GE delivered a 10,000 cycle version which proved of limited use and could not be directly used as a radio transmitter. Fessenden's request for a faster, more powerful unit was assigned to G.E. engineer E. F. W. Alexanderson, and in August, 1906 he delivered an improved model which operated at a transmitting frequency of approximately 50,000 cycles-per-second, although with far less power than Fessenden's rotary-spark transmitters. The alternator-transmitter achieved the goal of transmitting quality audio signals, but the lack of any way to amplify the signals meant they were somewhat weak. On December 21, 1906, Fessenden made an extensive demonstration of the new alternator-transmitter at Brant Rock, showing its utility for point-to-point wireless telephony, including interconnecting his stations to the wire telephone network. A few days later, two additional demonstrations took place, which appear to be the first audio radio broadcasts of entertainment and music ever made to a general audience. (Beginning in 1904, the U.S. Navy had broadcast daily time signals and weather reports, but these employed spark transmitters, transmitting in Morse code). On the evening of December 24, 1906 (Christmas Eve), Fessenden used the alternator-transmitter to send out a short program from Brant Rock, which included his playing the song O Holy Night on the violin and reading a passage from the Bible. On December 31, New Year's Eve, a second short program was broadcast. The main audience for both these transmissions was an unknown number of shipboard radio operators along the Atlantic Coast. Although now seen as a landmark, these two broadcasts were barely noticed at the time and soon forgotten. There are no known accounts in any ships radio logs, nor any contemporary literature, of the reported holiday demonstrations — although H.P. Davis mentioned the Christmas Eve broadcast in a 1928 lecture at the Harvard Business School, the only first-hand account appears to be a letter Fessenden wrote to his former associate, Samuel M. Kinter, on January 29, 1932. In addition, Fessenden does not appear to have made any additional broadcasts intended for a general audience, and was actually promoting the alternator-transmitter as ideal for point-to-point wireless telephone service. Still, in retrospect, it was an important glimpse of the future of radio. (Although primarily designed for transmissions spanning a few kilometers, on a couple of occasions the test Brant Rock audio transmissions were apparently overheard by NESCO employee James C. Armor across the Atlantic at the Machrihanish site). The technical achievements made by Fessenden were not matched by financial success. Walker and Given had hoped to sell NESCO to a larger company such as the American Telephone & Telegraph Company, but were unable to find a buyer. Fessenden's formation of the Fessenden Wireless Company of Canada in Montreal in 1906 may have led to suspicion that he was trying to freeze Walker and Given out of a potentially lucrative competing transatlantic service. There were growing strains between Fessenden and the company owners, and finally Fessenden was dismissed from NESCO in January of 1911. He in turn brought suit against NESCO for breach of contract. Fessenden won the initial court trial and was awarded damages, however, NESCO prevailed on appeal. To conserve assets, NESCO went into receivership in 1912, and Samuel M. Kintner was appointed general manager of the company — the legal stalemate would continue for over 15 years. In 1917, NESCO finally emerged from receivership, and was soon renamed the International Radio Telegraph Company. The company was sold to Westinghouse in 1920, and the next year its assets, including numerous important Fessenden patents, were sold to the Radio Corporation of America, which also inherited the Fessenden legal proceedings. Finally, on March 1, 1928, Fessenden settled his outstanding lawsuits with RCA, receiving a large cash payment. After Fessenden left NESCO, E. F. W. Alexanderson continued to work on alternator-transmitter development at G.E., mostly for longrange radiotelegraph use. It took many years, but Alexanderson eventually developed a high-powered alternator capable of transmitting across the Atlantic, and by 1916 the Fessenden-Alexanderson alternator was more reliable for transatlantic communication than spark apparatus. Also, after 1920, audio radio broadcasting became widespread, using vacuum-tube transmitters rather than the alternator, but employing the continuous-wave AM signals that Fessenden had helped introduce in 1906. In 1921, the Institute of Radio Engineers presented Fessenden with its Medal of Honor, and the next year the City of Philadelphia awarded him a John Scott Medal and a cash prize of $800 for his invention in "Continuous Wave Telegraphy and Telephony", and recognized him as "One whose labors had been of great benefit". Although Fessenden ceased radio activities after his dismissal from NESCO in 1911, he continued to work in other fields. As early as 1904 he had helped engineer the Niagara Falls power plant for the newly formed Hydro-Electric Power Commission of Ontario. However, his most extensive work was in developing a type of sonar system for submarine communication, as well as a method for locating icebergs, to help avoid another disaster like the one that sank Titanic. He patented the basic ideas leading to reflection seismology, a technique important for its use in exploring for petroleum. At the outbreak of World War I in August, 1914, Fessenden volunteered his services to the Canadian government and was sent to London, England where he developed a device to detect enemy artillery and another to locate enemy submarines. In 1915 he invented the fathometer, a sonar device used to determine the depth of water for a submerged object by means of sound waves, for which he won Scientific American's Gold Medal in 1929. He also developed an early form of microfilm, that helped him to keep a compact record of his inventions, projects and patents. In 1923, Fessenden privately published the first six chapters of a book titled The Deluged Civilization of the Caucasus Isthmus, a somewhat diffuse discourse on his theories about early civilizations, genetics and contemporary government and industrial policies. Five more chapters were eventually added to Deluged, with the last four issued posthumously in 1933 by the inventor's son. In early 1925, Radio News invited Fessenden to write a multi-part biographical series called "The Inventions of Reginald A. Fessenden". Although this was expected to be primarily an overview of his radio work, Fessenden instead covered, in great detail, topics from his Deluged book plus his early life. The series was terminated after eleventh parts had been published — by then Fessenden had only worked his way up to 1893, so almost nothing was written about the radio inventions. The main source for information about Fessenden's radio work is his widow's biography of the inventor, Builder of Tomorrows, published in 1940. Fessenden's private residence at 45 Waban Hill Road in the Chestnut Hill district of Newton, Massachusetts is on the National Register of Historic Places. Although Fessenden's antenna at Brant Rock, Massachusetts was demolished in 1917, the insulated base on which it stood still survives. In 1944, his son donated the inventor's papers to the North Carolina State Archives in Raleigh. This page was last modified 11:40, 17 November 2007.